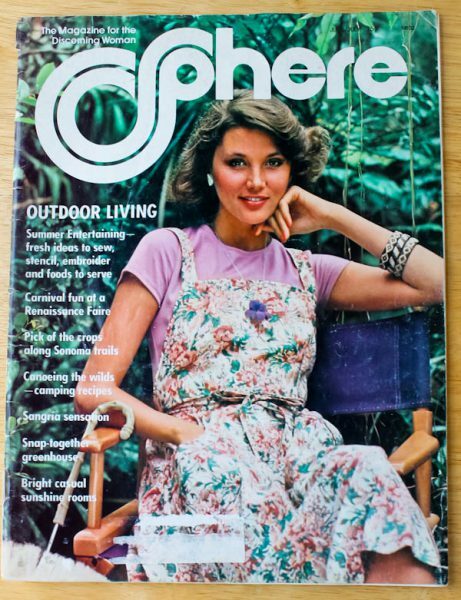 When the flood waters destroyed my Culinary Cellar in July, I was just about to write my monthly vintage Sphere magazine blog for the June/July 1975 issue. This issue was upstairs on my desk ready to go so it was saved from the flood. Originally I was going to make a “Cherries and Berries Torte” which made sense for that time of year. But since it is now November and I have to do catch-up with the Sphere blogs, I went through the magazine again to find a different recipe that seemed more in tune with now, if possible. I found one that made no sense for June or July, but perfect for November. Maybe it was in that issue because Swiss chard could have been in gardens then, but to me, it sounded more like something I would make in the Fall- a stuffed roast chicken. It turned out such a lovely color and was moist and juicy. The stuffing of French bread cubes, Swiss chard, pork sausage, onion, celery, garlic, parsley, basil, and Parmesan was so good. There was enough leftover after stuffing the chicken to place the remaining in a small baking dish. 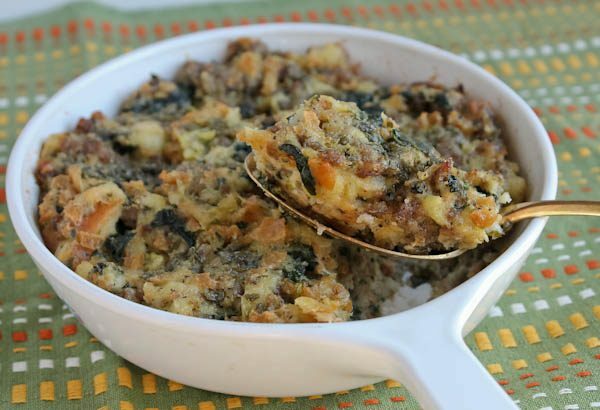 This stuffing would also be good for a turkey or baked and served with a pork roast. Other articles in the magazine included a large section on Sonoma County, California with all kinds of great summer recipes like chive deviled eggs, zucchini soup, a blueberry wine souffle, marinated peppers and mushrooms, a boysenberry cream cheese pie, and a French blueberry tart with a butter pastry that sounds amazing. It was followed by articles and recipes for camping, summer fairs, and recipes from an Italian villa. I will have to revisit this issue next summer because there are so many recipes that I would like to try. In the meantime, let’s not wonder why a stuffed roasted chicken was thrown into a summer issue and just enjoy it! For Stuffing: Pour enough milk over bread slices in a bowl to saturate. Cover and refrigerate for 1 hour. Press bread lightly in a sieve to get out as much liquid as possible, then crumble slightly. Cook chard uncovered in a small amount of salted water for 5 minutes and drain; set aside. Brown sausage in a large skillet, then add onion, celery, and garlic. Cook until vegetables are tender, about 5 minutes. Stir in bread, chard, parsley, egg, cheese, and basil. Taste for salt; set aside while preparing chicken. Heat oven to 375 degrees F. Pat chicken dry and fill cavity with stuffing. Tie drumsticks together with kitchen string. 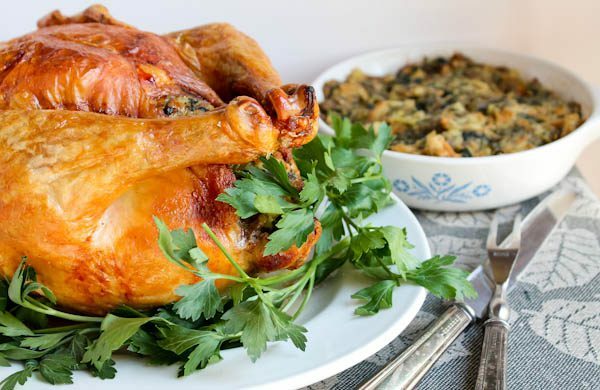 (Leftover stuffing can be placed in a small baking dish and baked the last 15 or 20 minutes of roasting chicken). Place chicken breast side up in open shallow roasting pan and brush all over with melted butter. Roast uncovered for about 2 to 2-1/2 hours depending on exact size of chicken. 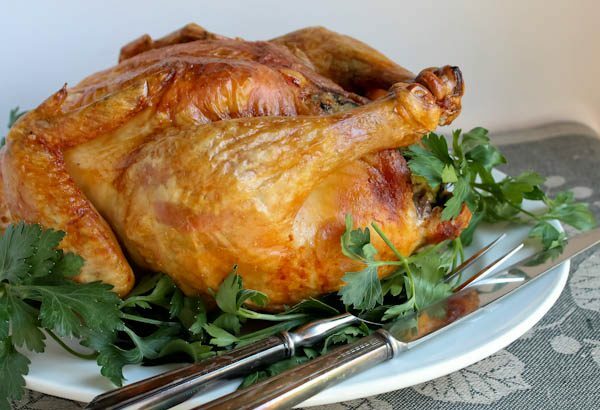 Chicken is done when thickest parts are fork-tender and drumstick meat feels very soft when pressed between fingers. Let chicken rest about 10 minutes before slicing. Debbie, thank you for posting this latest recipe! Sounds yummy! I love cooking with Swiss Chard. I adds a lot of flavor. Will definitely give this stuffing a try.